Panelists Rev. Dr. Otis Moss 3rd, Dr. Prabhjot Singh, Lisa Anderson and Rev. Dr. Raphael Warnock, with moderator Rev. Dr. Katharine Henderson. Sunday, August 12 was no ordinary day of worship on Martha’s Vineyard. In the morning, the senior pastors of two famous urban churches preached at about the same time in different towns, bringing in hundreds of listeners apiece. Union Chapel in Oak Bluffs was packed for Rev. Dr. Otis Moss 3rd, of Chicago’s Trinity United Church of Christ. And an overflow crowd turned out at the First Congregational Church of West Tisbury to hear Rev. Dr. Raphael Warnock, of Ebenezer Baptist Church in Atlanta—Martin Luther King Jr.’s home church. This is the ninth summer Mr. Warnock has delivered a summer sermon there. 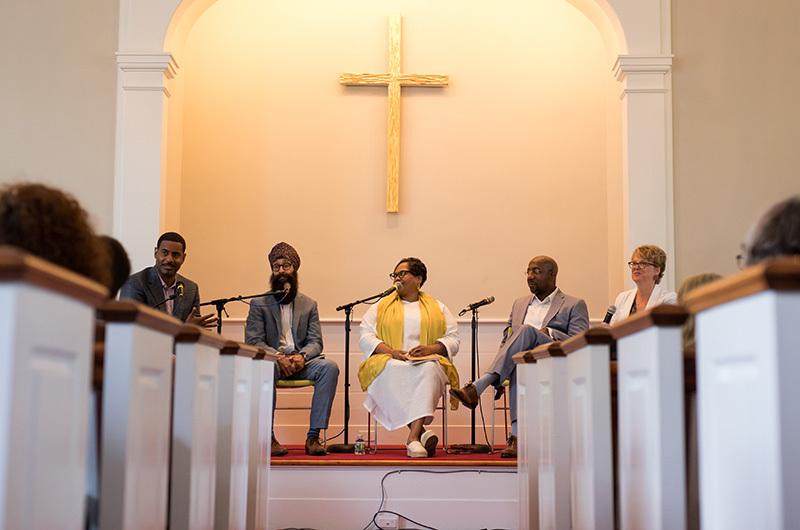 Later in the day, the two pastors joined forces at the West Tisbury church in a multifaith, multiracial panel discussion on the topic Bridging the Deep Divides: a Conversation on Faith, Struggle and Making a Way Forward. “We think they’re the prophets of our time, and those of you who have heard them preach probably think so, too,” said the Rev. Dr. Katharine Rhodes Henderson, a Presbyterian minister and president of Auburn Theological Seminary, who moderated a conversation that centered on race, resistance and morality. Auburn is a 200-year-old institution in New York city that focuses on leadership in progressive causes. All four of Sunday’s panelists are affiliated with it, as board members, senior fellows or staff, and most of them also attended Union Theological Seminary with West Tisbury pastor Rev. Cathlin Baker. Lisa Anderson, Auburn’s vice president for Embodied Justice Leadership and founding director of its Sojourner Truth Leadership Circle for women of color, joined the pastors on the panel along with physician, professor and author Dr. Prabhjot Singh, who chairs the Department for Health System Design and Global Health at Mt. Sinai in New York city. A direct connection to Martin Luther King Jr. ran through the room, not only because of Mr. Warnock’s pastorship at Ebenezer Baptist, but also in the quiet presence of Reverend Moss’s father in the audience. Rev. Dr. Otis Moss Jr. is a longtime civil rights activist who was friends with both Martin Luther King Jr. and his father Martin Luther King Sr., and remains influential in social justice movements. On the first anniversary of the white supremacist rally that led to three deaths in Charlottesville, Va., Ms. Henderson asked Otis Moss 3rd to talk about the divisions between Americans at this moment in history. Mass incarceration is Mr. Warnock’s central concern. “It is a burden that will not let me go,” he said. “I see mass incarceration as a central moral issue to which all of us have to respond in some way,” Mr. Warnock continued. “It is perhaps the clearest iteration of the old virus and original sin of slavery and white supremacy in America,” he said, because the criminal justice system reaches far beyond court and prison to limit access to health care and other basic needs. “I call it the new and improved Jim Crow,” he said. More African-Americans are in the criminal justice system today than were living in slavery in 1850, Mr. Warnock told the audience, and America has a greater share of its population behind bars than did South Africa during the apartheid era. “The black church, born fighting for freedom, has got to be involved in this struggle,” he said. Dr. Singh, who has been violently attacked several times since 9/11 (a Sikh, he wears a beard and turban) talked about “turning the prism” through which we look at events. After a mob of young black and brown men, some on bicycles, badly beat him in Harlem where he works, Dr. Singh said he resisted publicity about the event because he felt it would unfairly stigmatize the residents. “I felt deeply, viscerally that I wanted to share a sense of repair... and compassion with my own [Harlem] community,” he said. His Sikh community felt he wasn’t strong enough in speaking out against the violence. But the doctor was shocked when a local teen told him the police had hauled in every black boy with a bike for hours of questioning. “That’s this continuous turn of the prism that we are always looking through,” Dr. Singh said. On a person-to-person level, “a sense of repair is always called for,” Dr. Singh continued. Even when facing someone who opposes everything you believe in, “be humans first... and then fiercely resist,” he said. Ms. Anderson, whose work at Auburn centers on wellness and wholeness, noted that many people are “on alert” and unable to relax in the current political environment. “How do we not let this moment rob us of joy?” she asked. Asked what’s next in the movement for equal rights and a more just world, Mr. Warnock recommended “intergenerational, principled conversation” but urged action as well. “I just want to encourage us to keep moving and to struggle even when we are not exactly sure what the next move is,” he said. The original civil rights movement was not “a magical time” when people knew just what to do, Mr. Warnock reminded the audience. “It’s always been complicated. It’s always been wonderfully and marvelously messy,” he said. Often murmuring and calling out in agreement with the speakers’ words, about 130 people attended Sunday’s discussion, which Ms. Henderson said is the second in a planned series of annual Auburn talks on the Vineyard. Auburn board member Ellen Wingard of Chilmark was one of the event’s organizers. “It’s been a wonderful convergence at a time when we’re seeking ways of channeling our despair or our hopelessness into action,” she said. I am sorry I missed these Sunday services. I was back in LA attending the 8am service at the 5,000 seat West Angeles Cathedral where Bishop Charles Blake preached a similar message, including the important role of the black church as an independent social, economic and moral force.